The negative effect air pollution has on public health is well researched and well known. With that said, air purifiers are a much needed tool in protecting general well-being. For facility managers, remaining cognizant of and improving indoor air quality is imperative because the health of others is in their hands. Facility managers can make a commitment to the health of their building occupants by removing airborne contaminants. While dust and other airborne particles may seem innocuous and common, they can contribute to several serious long-term health problems. Asthma is responsible for more than 3,300 deaths, 10 million missed school days and 14 million missed work days in the U.S. each year, according to the Centers for Disease Control and Prevention. Volatile organic compounds and other contaminants in the air can trigger an asthma attack and cause immediate symptoms such as watery eyes, drowsiness, headaches and difficulty breathing. This is one of the most prevalent health problems associated with poor indoor air quality and facility managers in schools and offices can potentially reduce absenteeism by making the air they share a priority. Numerous infectious diseases such as influenza can spread through the air. Poor indoor air quality also causes lung irritation and respiratory tract infections, specifically in children. Many common volatile organic compounds (VOCs) are believed to be carcinogenic, leading to lung and other types of cancer. Formaldehyde fits into this category, and is one of the more commonly known hazards to indoor air quality. Once used to insulate houses, formaldehyde resin can still be found in some wood-pressed furniture. VOCs in general can be emitted from cabinetry, flooring, building products and household cleaners. Reducing these emissions in shared spaces is of the utmost importance to public health, but the AeraMax Professional air purifier take it a step further by removing 99.9 percent of these harmful contaminants. A 2008 study determined that indoor air filtration significantly improves microvascular function for the elderly in as little as 48 hours. In general, fine particulate matter can travel deep into the respiratory tract where it can then affect the heart and lungs. Research suggests exposure to indoor air pollution causes and exacerbates chronic obstructive pulmonary disease worldwide. 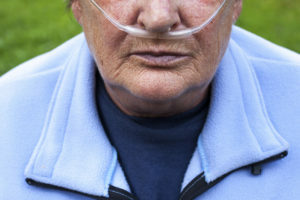 Common recommendations for reducing the symptoms of COPD include removing dust and chemical vapors from the air, limiting exposure to smoke and improving ventilation. An air purifier filters the air and help achieve all of these goals at once. Indoor air quality expectations have to change. By improving our air, we can reduce long-term health risks and lessen the dramatic impact of these conditions. In shared spaces, facility managers are on the frontlines and can make a difference to public health.